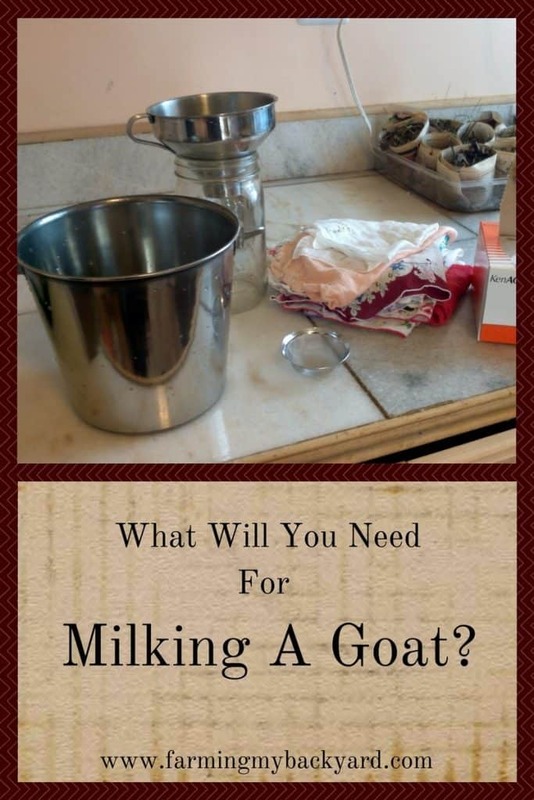 What Will You Need For Milking A Goat? Milking a goat seemed very mysterious and difficult the first time I set out to try. And what was I supposed to do with the milk after!?! Plus it seemed like there were so many different ways to do things. Milking machine or hand milking? Raw or pasteurized? What did I need to have on hand before I even started milking my goat? What if I forgot something important? Thankfully, milking a goat is fairly straightforward, and if you just have a few goats hand milking is quick and easy. One of the best parts of owning your own goats is that you can keep the milk clean and feel confident in its safety even when you drink raw milk. Tasty treats for the goat. Rolled oats work well. A stainless steel bowl or bucket. A sturdy mixing bowl is perfect. Fill up my large stainless steel mixing bowl with warm water, Dr. Bronner’s soap and a dash of Clorox. Carry out the bowl, my milking pail with an ice pack in it, a kitchen towel, and two smaller cloths and put them in the garage. Go get the goats (I suggest bribery to accomplish this) and brush them. Put one on the stand and tie the other out of reach of the food bowl. (Good luck). Wash my hands and get a handkerchief wet with the soap/bleach mix. Dry my hands and wash the goats udder. Carry the milk into the kitchen, pour it through the stainless steel filter with a milk filter inside. After goats are put away, wash everything and rinse with bleach. Move milk from freezer to fridge. 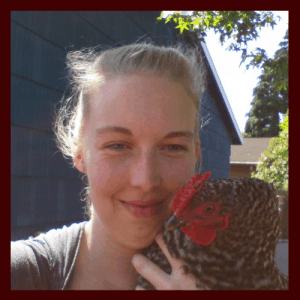 If the babies are still nursing on the mama, you don’t need to use a teat dip. However, if they are not, it’s a good idea to use a teat dip after milking to discourage the bacteria that cause mastitis. You can buy it or set aside some of your udder wash in a small cup. Just dip the teat in the cup before putting the goats away. If you are training your goats to the stand, you can get them used to the routine even before they are in milk. Feed them on the stand and then run your hands all over them so they get used to the stand and to your touching them. Milking will be much easier if they are calm and relaxed. Remember when you are learning to milk, it’s okay to mess up. She WILL stick her foot in the bucket, it WILL make your hands ache, and it WILL get easier the more you do it. Give yourself lots of time and slack, and don’t stress if you think you’ll never figure it out. You can! Once you get it down, you can milk out a goat in five minutes. Truly. The basic idea is you grasp the teat near the top of the udder with your thumb and index finger to prevent the milk from going back up into the udder. Then press inward with your other fingers to move the milk down and out. Don’t pull downward or you will hurt your goat. It’s easiest to learn how by watching someone else, and then and lots and lots of practice.